This mod does one thing-- it up-sizes or increases the max stack size per slot of various Minecraft items in inventories (player, chests, dispensers, etc.). Ever get frustrated that you can stack 64 anvils into a slot but only 16 eggs? Or that it's OK to stack 64 fences and gates, but only 16 signs? Well be frustrated no more! Stack your eggs to the sky (well, 64 high)! Need to carry a double-chest's worth of lava buckets? Just stack those empties to 64 and head to the nearest lava lake-- 64 lava buckets, 1 slot, done! 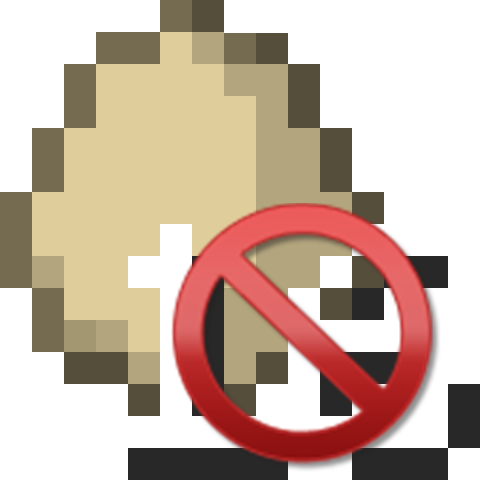 Out of the box, upsizer mod will up-size items that are already stackable like signs, eggs, empty buckets, etc. However, you can also up-size items that are limited to just one item per slot by default (but first, read "the warning" below). Up-sizing is not limited to vanilla Minecraft items, you can also extend the mod's configuration to up-size items from other mods. Upsize-ready (Harmless) Items - these are items that already support multiples per slot but have some imposed limit in the interest of "fair" or "balanced" game-play or some such thing. Examples include: signs, banners, eggs, ender pearls, buckets. Up-sizing these should not trigger any issues unless there is another mod installed that requires the vanilla stack size (which would be odd but you never know). Damageable Items - these are items that can take damage and are probably limited to one-per-slot as each damage level is effectively a new type of item. Up-sizing these sort of items is most effective for storing multiple new or undamaged items. You should still only use these items with one per inventory slot. In fact, when crafting new items don't even have a damaged version in your inventory as Minecraft might merge the new items into the same slot as the damaged one(s). Examples include: tools, weapons, and armor. Contained/er and other special use Items - these items may be limited because of how they are used. Up-sizing these items is also just a way to increase your storage of unused items as Minecraft is often hard-wired to assume use of a single unstacked item at a time. Examples include: cakes, stews, filled buckets, filled potion bottles, and enchanted books. So here it is officially, "the warning": when you up-size items that are usually limited to a single item per inventory slot, pay attention before using the stacked items as a single item (this goes for using the item directly or indirectly via crafting or smelting). Or better yet, save yourself any pain and just don't do that. Store the items stacked; always unstack to a single item before using. Do NOT up-size filled potion bottles (aka water bottles) unless you don't plan to use them for brewing. Minecraft requires that the potion items have a max stack size of 1; anything else is rejected and you cannot put that item into the brewing stand's inventory slots. If you have built standard item sorters or filters with hoppers for some of the items you want to up-size, you might need to adjust your hopper filters. If you're using an upsized item in a hopper timer, you will definitely need to adjust it. In particular, you will need to make sure the number of filler items you use in the filter or timer hopper is adjusted for the new max stack size. Normally, items like eggs and ender-pearls stack to 16 and so you'd use perhaps 12 filler items in your hopper filter; if you increase the max stack size for eggs or ender-pearls, you will need to adjust the number of filler items up (the exact change, if any, would depend on you filter's design and the max stack size you've chosen). You can control whether upsizer mod will touch a particular item or particular class of item (tools, weapons) by changing its configuration file (wabbity_upsizer.cfg). Note that out-of-the-box, the mod will only check and change items in the "Harmless" category as described above. All other items require that you add or change the proper configuration option. To up-size something, you need to tell upsizer mod to both check for that item and what the new max stack size should be. Read the linked config file for an example of how to do this. Post in the Comments section if you have any questions. The picture shows stack size of book and quill, but ingame it only stacks to 1 still, and I cannot find any option for book and quill in the config. Has it been disabled? In the 'S:other_objects_maxstack_sizes' list add the following to stack to 32 (example): minecraft:writable_book=32. For enchanted books it would be: minecraft:enchanted_book=32, etc. It is disabled by default. You have to change the stacksize yourself explicitly. Would it be possible to make this exceed the 64 count for so that a stack could have a quantity of say 128 or 256? You can set the item's max stack size to anything, but most Minecraft inventories have a hard limit of 64 that the mod can't change. The game takes the minimum of the two values so effectively you're kindof stuck w/ 64 most times. For me it was just that I never had a 1.9 or 1.10 based game setup. I don't imagine there's anything that is preventing such a version in general. Lots of people just kindof zipped right to 1.11x from 1.8x or 1.7x worlds. Why as default option Cake, Boat, Minecart, Horsearmor stacking is disabled? It works without bugs. Also why just Oak Boats and just normal Minecarts are stackable? I know i can add these things on my own, but it would work and saves time. It may work for your game setup, but because these items are defined as maxsize=1 by default, it's what most players' game setup will assume (in particular players may use these items as 'non-stackables' in various redstone setups). To ensure the mod does not break someone's game setup just by the player installing it, the most conservative option is to let the player decide if changing these items is a safe thing to do. If you need help with the configuration, just post your question to this comment section. and i want to change the stacksize of cobblestone, please add config for this. If you want to increase the stacksize OVER 64, you will only be partially successful as the final stacksize of an item is always limited to the minimum of the item's max stacksize and the inventory's max stacksize (which is 64 for player inventories, chests, shulkerboxes, hoppers, etc.) In the above example, you can try changing NN to a value over 64, but the target inventory will have to support the bigger number. Hey, this mod looks awesome, but is there a chance for a 1.10.2 release? Afraid I leap-frogged with all my mods from 1.8.9 right to 1.11+, so there's no 1.10 based version. Sorry.